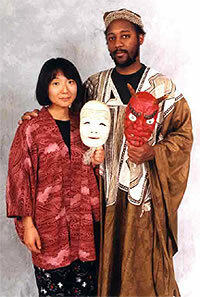 Motoko and Eshu shine up a storytelling event wherever they appear. they blend and tell as one. a sense of drama, a talent for singing, and present a seamless performance. Parents’ Choice Award-winning storyteller Motoko enchants audiences of every age with her weaving of ancient lore, original tales, lyrical movement and traditional music. 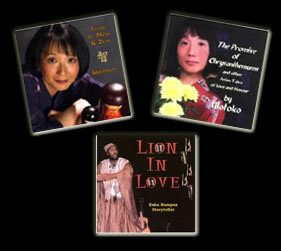 Her repertoire includes Asian folktales, Zen tales, comical tales from rakugo (a Japanese traditional style of storytelling), funny mime vignettes, as well as personal stories from her childhood in Japan and her life as an immigrant in the U.S. Motoko also offers K-12 classroom workshops and residencies on Japanese culture, creative writing, and storytelling. Her one woman mime program, “The Girl in the Mirror: Mime for Teens” addresses issues relevant to the lives of middle and high school students. 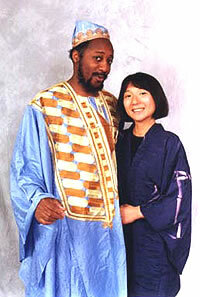 She can also be booked together with her partner Eshu Bumpus, a nationally-known storyteller of African folktales. Eshu Bumpus captivates his audience by telling a variety of African, African-American and World folktales leavened with music, humor and mystery. Eshu is a renowned storyteller, an accomplished jazz vocalist and a master at physical characterization. Eshu Bumpus' love for working with children began when he was just a child himself. At the age of 12, he began tutoring young children in math, nurturing their understanding and encouraging learning. In 1976, while a student at Hampshire College, he began teaching at an alternative elementary school housed at the Universirty of Massachusetts. He would write stories based on the children's history assignments that they would then perform as plays. It was then that he realized working with children and the arts would be his calling. Visit Their Secure Online Store Now!